Heat oven to 350°F. Spray 3-quart casserole with cooking spray. In large Dutch oven, cook and drain pasta as directed on package, using minimum cook time. Return pasta to Dutch oven. Meanwhile, in 12-inch skillet, heat oil over medium-high heat. Add garlic; cook and stir 30 seconds. Add eggplant, zucchini, yellow squash and salt; cook 8 minutes, stirring frequently, until tender. Add roasted peppers; cook 2 minutes or until thoroughly heated. Add vegetables and pasta sauce to pasta in Dutch oven; mix well. Spoon into casserole. Sprinkle with cheeses. Bake uncovered 30 minutes or until bubbly around edges and cheese is melted. Garnish with basil. 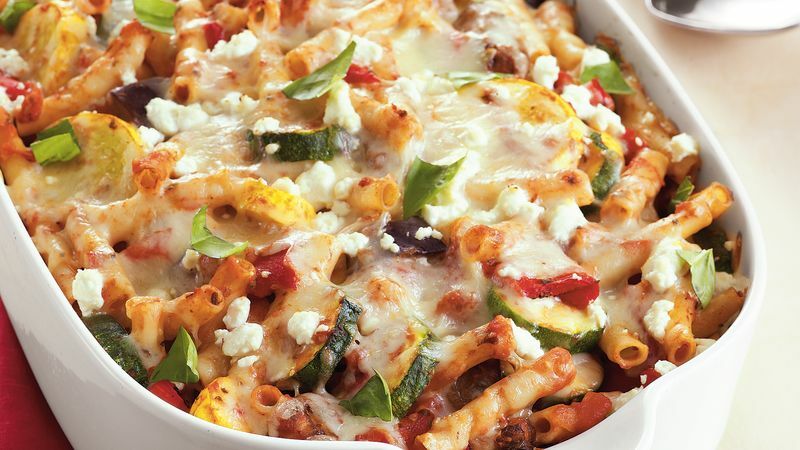 Pick any tubular pasta like penne for this recipe so that the sauce will cling to its ridges.